When you think gloves, you might think winter. Or you might think hospitals. Or kitchens. Or laboratories. Or a repair shop. There are a ton of things one might think of–gloves are that useful. They can keep you warm, they can keep you protected, and they can keep others protected as well. So why wouldn’t you consider them when it comes to your gardening needs? Sure, there may be people out there who want to connect with nature, and who think going bare-handed is the way to go about doing that. But these people are missing out on the joy gardening can bring, sans pain, and they’re opening themselves up to potential hazards that they could otherwise easily avoid. Remember, it’s not just soil that your bare hands are exposed to when you’re doing some yard work. There’s dust too, sharp rocks and thorny plants too. It may not sound like much, but these things can cause scratches and injuries, some of which can develop into something serious. And then there are insects and spiders–some poisonous, some just annoying–and a plethora of pests you can potentially come across while tending your garden. If you have allergies, these pests, and even the dust, can exacerbate them. Even soil isn’t totally harmless. That’s right, even simple soil can be a nuisance. It naturally wicks moisture, after all, and prolonged exposure to it can leave your hands dry, which makes them even more vulnerable to every other obstacle mother nature throws your way. A good pair of garden gloves can counteract or at least mitigate these issues. Can you imagine working without them? Picking up twigs and rocks and dirt and pinching soil and handling tools–all without gloves? It’s a preposterous proposition, no matter how you spin it. Sure, you can do it. But it’ll cost you. You’ll end up with rough, dry hands that have been through some hell. Nails will be broken, screams uttered or muffled, depending on how you handle the pain. But why put yourself through all that when you don’t have to? If you’re going to be working on your garden, you need a pair of gardening gloves. It’s as simple as that. But now the question is, which pair of gardening gloves? Well, that would depend on you and your needs. What kind of garden are you tending to? Any special plants or features? Is it a big garden or a small one? Any heavy lifting involved? Are sharp objects a concern? You must ask yourself these questions before making a decision–there are just way too many options to choose from, you can very easily choose the wrong one. That’s why this list has been compiled; it seeks to narrow down your search down to ten of the most quality gloves on the market today. It tells you everything you need to know all in one convenient place. Here's number one on the list, and it's number one for a reason. It's designed for both men and for women, first of all, so everyone can use it. And it's marketed for those who going to be dealing with rose gardens, but its uses are virtually endless. Hell, the very fact that it's marketed for rose gardens should tell you something. Have you ever been cut with a rose spine? It's no joke--it really hurts. And not only does it hurt, but these cuts can open you up to the possibility of catching a disease. And who wants that? Well, you won't get it with these; they're made of premium goatskin leather and can protect you not only from thorns but from poison ivy, poison oak, poison sumac and more. It's not only your hands you have to worry about. It's anything exposed and in the line of fire. These Rose Pruning Gloves by Exemplary Gardens cover you all the way up to the elbows. So whether you're foraging through spiky plants or just tending to your garden you can be sure your hands and arms are safe and remain blood and pathogen free. This particular feature is great for those with sensitive hands. If you have experience with gardening, you know that working for too long--especially with bare hands--can lead to dry and cracked skin. This is uncomfortable at best; downright dangerous at worst. These gloves by Exemplary Gardens feature a buttery soft texture because they've incorporated lanolin--which keeps hands moisturized and supple. When it comes to health and safety, there's no such thing as too much. In other words, good health is always more preferable to great wealth. But in this case, you can have both. The gloves are reasonably priced, durable, functional, and, honestly, an excellent buy if you're going to spending any time at all in your garden. 2. Amazing Stuff For You! Here's another great option for both men and for women. These are less for specialized gardening--or any gardening that involves spikes and excessive pricks--and more for everyday sort of labor. Excellent for handling tools--any kind, pruning shears, repair work tools, gardening tools--they feature a superior grip and are stretchable. In fact, their grip is powerful that you can even hold on to a slippery fish while trying to scale it! These are a small pair of gloves, unlike the first pair on this list. But don't be fooled. They may be small, but they're extremely versatile. From weeding to auto repairs to planting, these are an excellent choice for anyone. You're probably on this list because you're sick of getting cut while tending to your garden--or you're wary of cuts at any rate. With these gloves Amazing Stuff For You! you won't have to worry anymore. It's constructed with a puncture resistant nitrile coating, which serves to prevent cuts and scratches. Perhaps you didn't want to wear gloves in the first place. Every pair you tried seemed too suffocating for you. When you were done working and you took off your gloves, your hands would come out all stuffy and clammy and you just wouldn't be happy. Well, you won't have that problem with these gloves. They're abrasion resistant, work to reduce perspiration, and even offer protection against the cold and the heat. Honestly, for all the versatility these gloves offer, they really should cost more. Thankfully, they're quite cheap. So if you're looking for something durable and highly functional in a variety of scenarios and even weather conditions, this is your best best. And here's another excellent pair of rose pruning gloves. Constructed with tough goatskin leather, these are great for handling any prickly plant from cactus to roses. What's more, you can use them for pruning berry, citrus picking, and even to protect you from poison ivy, oak, and sumac. And just like number one on this list, this pair of gloves by Fir Tree offer protection all the way up to the elbow--so you can be sure that these are worth every penny. Are you sick of gloves that just don't seem to do what they say they do? How many times have your gloves ripped apart at just the sight of a cactus prick? Well, these gloves won't get scared so easily. They're puncture resistant--they're constructed with genuine goatskin leather, so they're tough and durable and perfect for your prickly plant handling needs. You would think it a great thing if a glove is described as tough. And you'd be right. But isn't it better if it's tough against spikes and thorns and soft on your skin? Well, that's what you get with these gloves. It was designed to make sure that when you slip them on, you won't be irritated by bulky, annoying, stiff seams. When you evaluate the price of something, you also need to factor in its expected longevity as well as how frequently you plan on using it. If you're a gardener--a serious gardener--these more than worth the money. They'll keep your blood free and comfortable at the same time, and they'll allow you to get work done safely and securely. These garden gloves by RZleticc were designed specifically for women. Like number two on this list, they're of the shorter construction--they cover you only up to the wrist. But, also like number two, they're highly versatile and suitable for many tasks. Whether you're gardening, trimming, rose pruning, or doing general work around the yard or warehouse, you'll find these gloves indispensable. You don't even have to worry about fit--one size fits all, although they are most suitable for women with medium to large hands. These features shouldn't be underestimated. These gloves by RZleticc have been designed with double stitched premium microfibers and include a padded palm and knuckle area. What this means is that you'll feel comfortable as you work and you can work as long and as frequently as you need to. You'll be able to handle tools and shrubbery with ease, without tearing the gloves or wearing them out. This is a great feature; even the top three gloves on this list can't boast this feature. Its double stitched construction makes this possible. The only caveat here is though that the finger area is thin and therefore not thorn proof. In any case, no matter what you're doing, you should always exercise caution--remember, nothing is guaranteed in life. But with these gloves, you can at least improve your odds. Another inexpensive pair of quality gardening gloves. For all the versatile uses this pair of gloves offers, the price is more than reasonable. In fact, it's a downright steal. Do you need proof that these are excellent gardening gloves? After all, most manufacturers laud their own product as the heralded of world peace and the end of world hunger. Well, these gloves by Legacy Gardens might actually be telling the truth. They offer a very unique money back guarantee--if you experience any cuts or grazes at all, you get your money back. Now that's confidence inspiring, isn't it? But don't get too excited. These are made from tough, cut and puncture resistant goat leather, so don't bet on getting your money back. 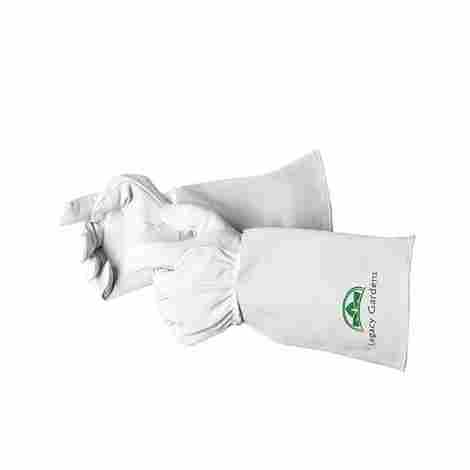 These gloves by Legacy Gardens were constructed with hypoallergenic materials. These are a great leg up for those who are allergic to things that can be found in gardens or in workplaces that require tough gloves like these. Keep dust mites and poison ivy and mold at bay with these allergy-fighting gloves. This is why we all need gloves, isn't it? To get rid of all the painful cuts and stings and scratches that we're all vulnerable to? Seriously, why wreck your hands to keep your garden looking beautiful? With these, you can handle thorns, twigs, rocks, and scissors with easy. These are quite inexpensive. They're similar to numbers one and numbers three on this list but are priced a little lower. 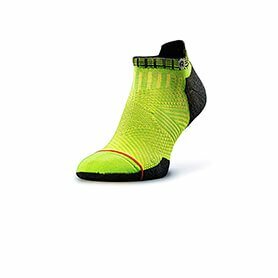 If you're looking for something sturdy yet comfortable, fitting yet breathable, then these are a great buy--for men and for women. And here's another tough goatskin leather option for you. If you're looking to prune overgrown rose bushes, or prickly weeds, or blackberry vines, or cacti, this is as good a choice as any. Designed with Canadian style gauntlet sleeves made from thick cow split leather, they reach up your forearms for up to six inches, providing protection from scratches and cuts the whole way through. You can even extend its uses go beyond the garden; you can handle animals, for example, and barbed wire. It'll even give you protection against sparks--that's how tough these gloves are. Unlike other gloves on this list, NoCry actually reinforced their gloves' fingertips and their palms to make them more durable and less vulnerable to cuts and punctures. The fingertips and palms on these gloves are reinforced with double layered goatskin leather to make for a very durable pair of gloves. This differs from the other similar gloves on this list that are also constructed with goatskin leather in that its uses are more varied. The fact that is reinforced makes it tougher against thorns and spiky plants. And it also offers protection against sparks, making it a great choice if your planning to do some light-duty welding after you've tended to your garden. For a glove constructed with tough, durable, high-quality goatskin leather, this really is dirt cheap. That added with its versatility and extra protective design makes it an excellent buy for both the layman and the handyman. Or woman, as it were--it was tailored for both genders. Here's yet another goatskin leather constructed garden glove. They too offer protection up to your elbows--but their cuffs stay up on their own and they're wide enough that you can wear heavy garments underneath. They also feature kevlar thread stitching and reinforced palms that are padded. This is to enable you to more safely handle spiky plants and even rose thorns. This is a great feature if you're looking to do some work in cold weather or are trekking some serious hazardous terrain that requires protection not just for your hands and arms, but for your entire body. If you find yourself having to walk through poison ivy heavy areas for example, or are working with a large rose garden, or something like that, this feature will come in handy. 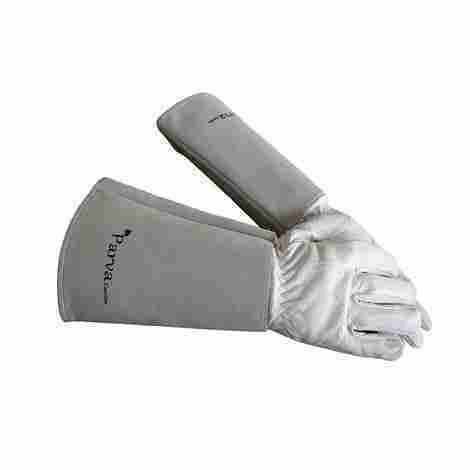 This glove by Parva Gardens is made with quality goat grain leather. That means it has a natural lanolin content. And that means that wearing it will ensure that your hands stay supple and moisturized as you work, and it will prevent them from drying out the way going barehanded would do and the way other lesser gloves would do. All in all, these are a pretty good pair of gloves. Nothing to laud, but nothing to complain about. The same could be said about the price. 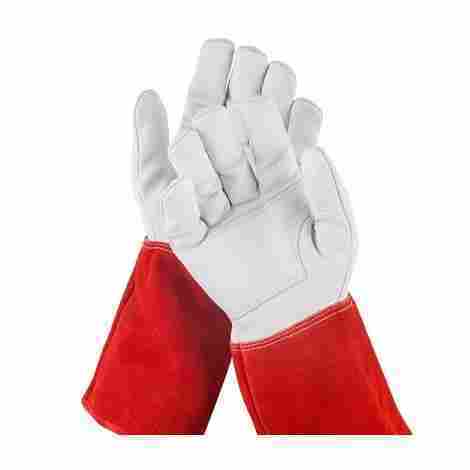 If a durable, useful pair of garden gloves is what you're looking for, then you've found them. This is a very, very basic gardening glove. There are no real special features--they offer protection and they're water resistant. They keep your hands from getting dirty and they're flexible enough and offer enough dexterity that you can handle light tools and move things around in your garden. If you're really in a bind, you can even use these gloves to navigate through your smartphone screen. They're extremely durable and dirt cheap--what's not to like? This glove's rubber coating is water resistant. That means while swimming may not be the best idea with them on, it still helps to keep your hands the right amount of dry while you water plants or deal with damp soil. Not only is the price ridiculously cheap, the deal is ridiculously great too. For one purchase you get four pairs. Each pair is extremely durable--you can use it frequently, for a long time before you feel the need to change it out. They're all machine washable too. Again, it's dirt cheap and you get four pairs for one purchase. For the average person with an average garden that isn't too hazardous, these are a perfect choice. Why get a top quality product when all you're trying to do is make your small private garden look nice? It's better to get something that just does the job. Well, these gloves by Showa Atlas will do that. This is another great glove for the general gardener--except this is for the more serious gardener. This is for the gardener who plants, digs, prunes, and is subjected to stings and pricks and all manners of nuisances she wants to rid herself of. This garden glove for women by Beville Gardens is constructed with goatskin leather--by now, hopefully, you know what a big deal goatskin leather is--so it works to prevent punctures and cuts and tears. These gloves may not be suited for heavy duty work, but if you're serious about tending your own garden, then you need to take a serious look at them. If you have sensitive skin, you've no doubt been the victim of mysterious rashes. Anything can set those off--allergens in the air or dirt or something you touch. 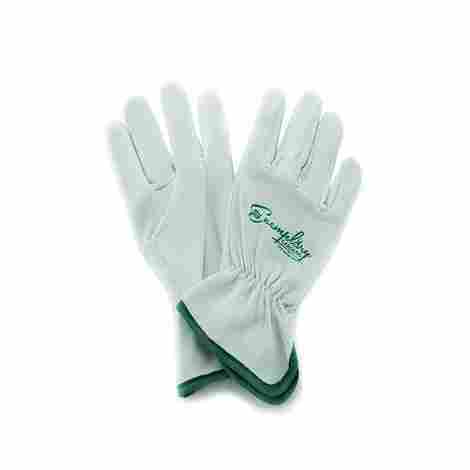 But with these gloves, keep the itching and the discomfort away while you work to keep your garden looking beautiful. Not much more to say about goatskin leather than what has already been said. It's tough, it's durable, and it prevents scratches and cuts. What's not to like? It also offers great grip and breathing room for your hands, preventing clamminess. This is probably the cheapest glove on this list--which is surprising, given its quality. In some ways, it even surpasses other items on this list that came before it--in terms of versatility and functionality anyway. All in all, it's inexpensive and worth having; it's a great buy. This list started with Exemplary Gardens glove and it's going to end with one too. These are very similar to number eight on the list, but are a bit more expensive and so ended up last. You may be sick of hearing this by now, but they too are constructed with premium goatskin leather, and they too are thick and puncture resistant and suitable for a variety of scenarios. They do offer some features that number eight doesn't, however, and for that reason deserve to be on this list. This feature comes in handy when you're going to be working for long periods of time. The wrists also come with a soft lining, which allows for superior fit and a more comfortable experience. This particular glove, Exemplar Gardens, features ergonomically designed thumbs. That makes it much easier to actually grip items comfortably without sacrificing functionality. That means you won't break things trying to transport them from point A to point B. Cheap and versatile. Not much more to say about this. 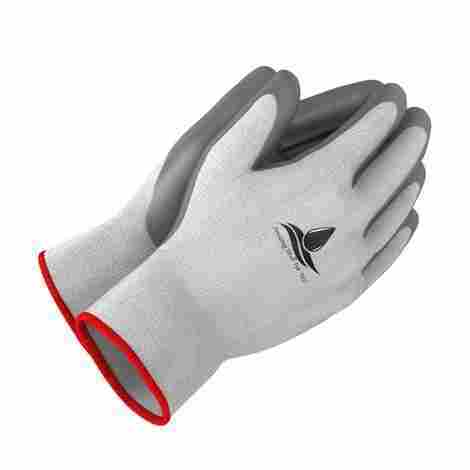 Depending on what you need gloves for, these are as good a choice as any--they're even suitable for certain heavy duty tasks. 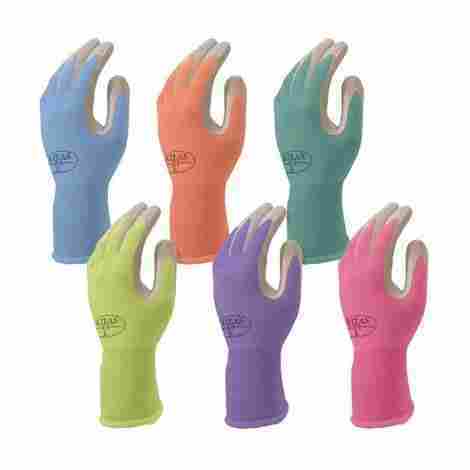 As you can see, there is a wide range of options to choose from when it comes to garden gloves. And a lot of them actually offer very similar sets of features and purport to do the same thing. But if you look closely, with a detached eye, you’ll see that they are all very different in their own way. Some gloves can handle certain tasks, sure, but not as well as other gloves can. And if those are the tasks are what you need garden gloves for in the first place, why would you choose the inferior product? You wouldn’t–simple as that. That’s why it’s important to do your homework. The gloves on this list have all been chosen for their durability, especially as they relate to more heavy-duty or frequent gardening. You may have noticed that all but one of the gloves on this list have been constructed using leather–or more precisely, premium goatskin leather. This is for a reason. But before we get into that, let’s take a look at the other kinds of material you can opt for and why you might want to, as well as why you might not. 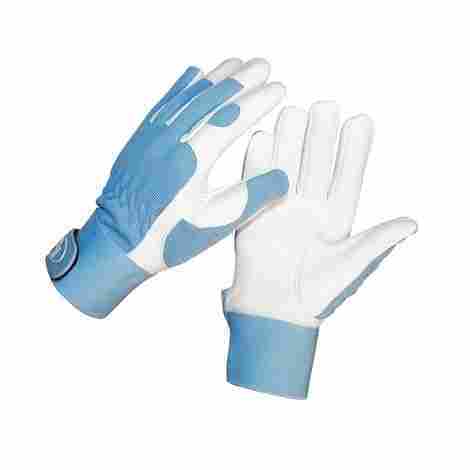 Nitrile coated gloves provide all the features you need–to a lesser extent than leather. They provide considerable resistance to cuts, punctures, abrasions, and even oils and fuels. For certain types of work–like if you’re working in the automotive industry for example–these types of gloves are indispensable. And one reason you may be drawn to these over premium goatskin leather construction favored in this list is that of its weight. It is much lighter than leather gloves. Their relative lightness helps to maintain the same level of dexterity and grip as going barehanded. So theoretically, you can accomplish more, more quickly. And by that same token, it’s thinner too, so it fits your hand better, offering much more comfort and flexibility, whereas its leather counterpart may feel a bit cumbersome and even restricting. And yes, you can find varying degrees of thickness between nitrile coated gloves to adjust to whatever task it is you’re trying to perform. 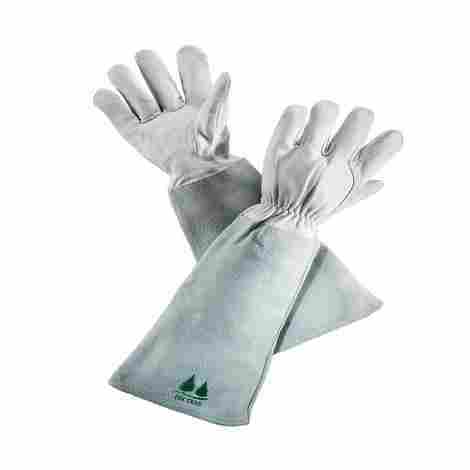 But the fact of the matter is, you’ll never be able to tackle any heavy duty gardening tasks with nitrile coated gloves alone; can you imagine trying to navigate through thorny bushes with a thin pair of gloves? Or through spiky cacti? Or even through soil teeming with biting insects? You’ll definitely want something thicker. Something that has less of a chance to puncture. You might be thinking that you’re not looking to go crazy. You just want to do some light gardening in your front yard or in some other small space. You don’t need all that extra bulk that’s characteristic of leather gloves. You just want something you can work with, that’s all. Something that’s cheap–and cotton gloves are dirt cheap. Probably cheaper than any other kind of glove. They’re readily available, they’re lightweight, they’re breathable, they can potentially keep your hands clean of dirt and soil–what’s not to like? Well, here’s what they’re not: they’re not waterproof or even semi-water-resistant; they don’t offer any protection whatsoever from cuts, abrasions, or pokes; they leave you open to chemical contamination, or poison transference; they don’t protect against blisters, and they are not punctured resistant. Another thing you might want to consider is the moisture-sapping properties of soil. Prolonged exposure to soil can very quickly dry out the skin of your hands. Cotton garden gloves won’t protect you against this property. And not only that but because it doesn’t protect against abrasions or blisters–or anything really, besides dirt–that means your hands may become subject to calluses and hardening, leaving you with rough hands that you may not want to have. This is not to scare you away from cotton garden gloves, which do have their benefits but to offer you guidance and information with which to make the best decision. In the end, you get what you pay for. Cotton garden gloves may be cheap, but that’s only because they’re not at all durable. A few uses and they may wear out and even tear. If you’re looking to save money in the long run and keep your hands healthy, smooth, and clean, you might want to invest just a little bit more money in the short run. The goatskin leather gloves on this list may cost more than most cotton gloves, but they last a hell of a lot longer too and do a hell of a lot more. A lot has already been said about this sort of construction material throughout the page. Yes, it’s true that goatskin leather gloves are bulky. It’s true that this bulkiness may necessitate a loss of grip and some control. But these losses are worth it, if only because of what you gain. You gain protection from the elements and from the spikes and thorns and stings and even shocks you may have to deal with in your line of work or your hobby. You gain protection, too, from various poisonous sources–at least for the area of skin the glove covers. If you look through the list, you’ll see that each glove of this construction has been designed differently–to do different things. Some of them cover your whole arm, up to the elbow. Others only cover a few inches up the forearm. Still, others cover only your wrists. Remember, you have to pay attention to details, so you know what you’re getting. For example, if you’re looking to guard against thorns, and you need something puncture resistant, through and through, choose a glove that’s reinforced in the palm as well as the fingertip area. Some of them are only reinforced at the palm. Others are not reinforced at all. Again, pay attention to the details! Doing so ensures that your purchase will be a good one and one that’ll last you a long, long time. And lastly, each glove on this list has been chosen for its functionality and its uses. Some of the gloves have similar uses, but with different defining features and designs between them that give each an edge in one aspect or another. For example, one can have ergonomic wrist design, which offers you added comfortability even as you work longer and more frequently. You may consider this sort of glove if you plan on using your gloves over long periods, or if your job necessitates that you do. As has been stressed over and over, you must do your due diligence. If you’re just a weekend gardener, someone who isn’t necessarily passionate about gardening and who just wants to maintain a pleasing aura about their home, there are gloves on the list that’ll not only fit your specific functional needs but your budgetary ones too. Remember, the smaller, lighter gloves are not only cheaper, but they offer more dexterity, nimbleness, grip, and flexibility as well–you shouldn’t give those up if you don’t have to. Otherwise, you’re just making things harder on yourself than they should be. Conversely, if you’re going to be dealing with dangerous elements–thorns, poison, spikes, biting insects, that sort of thing–then you should absolutely give those things up if only to be safer and more comfortable. In the end, it all depends on you, what you want, and what you need. Figure those out and you’ll be just fine. Q: What is the difference between a man’s glove and a woman’s glove? A: Honestly, nothing. At least not in terms of functionality. There may be special patterns or designs on a glove specially marketed to men or to women, but that may be about it. Women’s gloves also tend to be smaller, but, really, if a glove fits you, it fits you. That’s all. 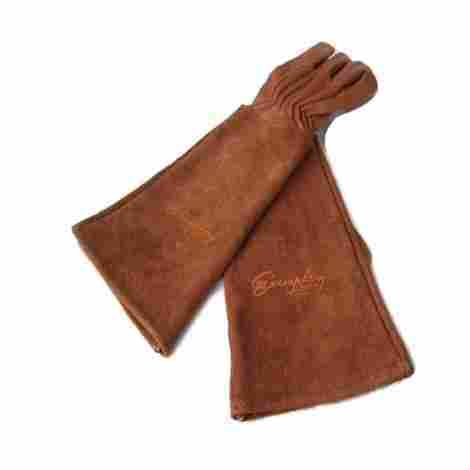 Q: Are all of these gloves made with premium goatskin leather? A: All but one, yes. The one that’s not is made from premium microfibers and is recommended only for general, every day, the light uses. It may be marketed towards those who need a good rose pruning glove, but it isn’t recommended for that. Q: I have allergies that get worse and make my hands dry and flaky when I tend my garden–is there anything on this list for that? A: Yes–there are several hypoallergenic choices on this list. But these hypoallergenic choices do much more than just guard against allergies; they have unique features and functions. It’s best for you to read through them and try to match what you want and need with what is offered. Monitor, Why Use Gardening Gloves?